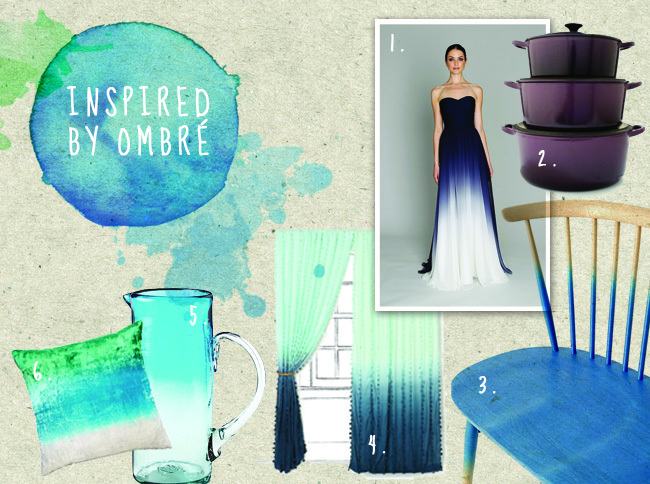 Perhaps it's my indecisive nature, but I am all about ombré these days. One hue fading into another hue means I don't have to make a definitive color decision and I get the best of both! I LOVE that I'm spotting it everywhere from the runway to retail and now even in my living room. This trend is certainly popular in weddings, so naturally cake designers have caught on. Many are creating beautiful ombré patterns with ruffled fondant (see the incredible work of Maggie Austin). I work with fondant all the time, but I know most of you don't. Therefore, I've decided to simplify the ombré cake by replacing the fondant with buttercream. If you want a shockingly colorful cake, use food coloring (it's hard to achieve strong color without it), but today I'm opting for the subtle touch of color with the natural hue of pomegranate juice. The juice ads a tangy, sweet flavor and a hint of purple. 1. Preheat the oven to 350 degrees. 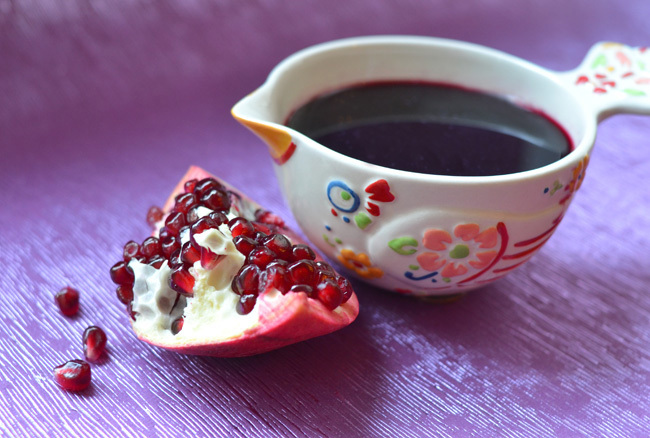 Combine both bottles of pomegranate juice and 2 tablespoons of sugar in a saucepan and bring to a boil. Reduce heat and simmer for about 20 minutes until reduced to 1 cup, stirring often. Syrup should almost be as thick as molasses. Remove from heat and let cool to room temperature. Divide into two equal batches. 2. Grease and lightly flour the three 6" cake pans and set aside. Whisk or sift together the cake flour, baking powder and salt into a medium sized bowl and set aside. In the bowl of an electric mixer fitted with the paddle attachment, cream the butter and sugar until pale and fluffy, about 2 minutes. Reduce the speed to low and add the flour mixture, alternating with the milk mixture, making sure to end with the flour mixture. Add in the vanilla and continue mixing until combined. 3. In a clean mixing bowl, beat the egg whites until stiff peaks form. Gently fold the egg whites into the batter in 2 batches, mixing until no lumps remain and the batter is smooth. 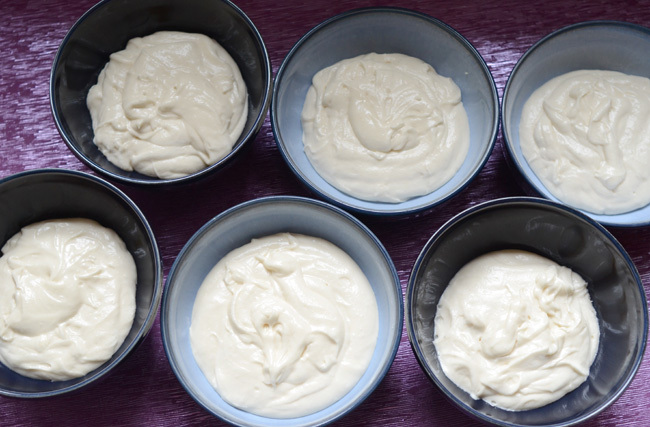 Divide the batter into 6 small bowls, one cup of batter per bowl. 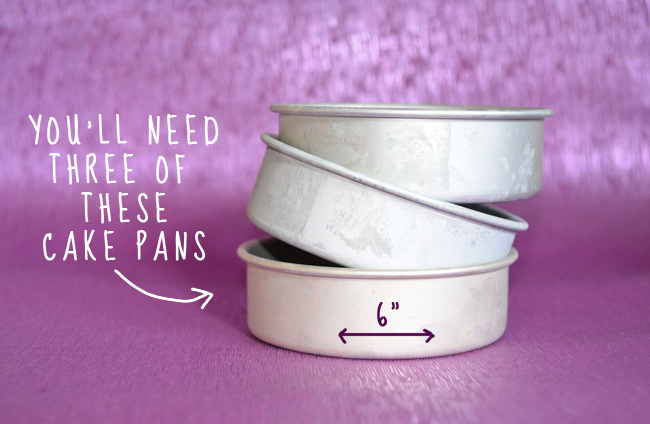 Set aside one of the bowls, as you will not be tinting it. 4. Now you will tint the batter in the five remaining bowls. 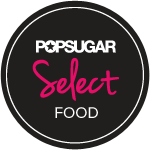 Using one of the pomegranate syrup batches, spoon out 2 teaspoons syrup and thoroughly mix into the batter in one of the bowls. Set aside. Repeat this step with the four remaining bowls, adding 3, 5, 6 and 8 teaspoons of the pomegranate syrup to each batch. Feel free to tweak the amount of syrup you add to create the right gradient of color. 5. Pour the non-tinted batter into one of the prepared cake pans, then pour the second-lightest batch of batter in the pan, directly on top of the lightest batter. Gently smooth the batter out with an offset spatula, making sure the batters don't mix together. Set pan aside. In another prepared pan, pour the third-lightest batter and top with the fourth-lightest batter. Then pour the two remaining batches in the last pan. Bake for about 30 minutes, or until a cake tester comes out clean and the tops are springy to the touch. Cool completely, then invert your three cakes onto a clean work surface. Using a sharp knife, trim the rounded tops off the cakes. Divide each cake horizontally so you have 6 layers of cake total. 6. In a clean mixing bowl, combine 2 stick of softened butter and mix until light and fluffy. With the mixer on low, add the confectioners sugar, alternating with the milk. Add the vanilla and a pinch of salt and mix on high for 2 minutes. Frosting should be stiff and spreadable, not runny. Place the darkest layer of cake on a cake stand or plate and frost the top with a thin layer of buttercream. Place the second-darkest layer of cake on top and frost that with a thin later of buttercream. Repeat this step with the four remaining cake layers. Then crumb coat the cake by using an offset spatula to create a very thin layer of buttercream around the entire cake. Crumb coating seals in the moisture and prevents crumbs from ending up in your frosting. Place the cake in the refrigerator to chill for about an hour. 7. Use a spatula to spoon out about 1/6 of the white frosting into a piping bag or zip-lock bag with the tip snipped off. Set aside. 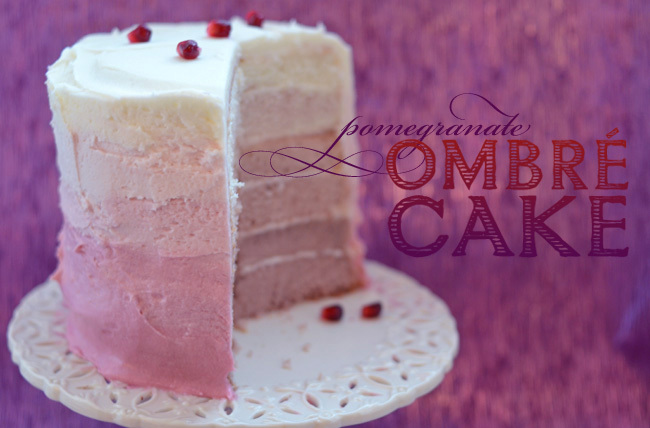 Using the remaining pomegranate syrup, spoon out 2 teaspoons of syrup into the frosting and mix until incorporated. Spoon out 1/5 of the frosting into a piping bag or zip-lock bag with the tip snipped off. Set aside. Add 3 teaspoons to the remaining frosting and beat until incorporated, then spoon out 1/4 of the frosting into a piping bag. Add 5 teaspoons of the syrup to the remaining frosting and mix until incorporated. Spoon out 1/3 of the mix into a piping bag and set aside. If your frosting begins to thin out, add more confectioners sugar to thicken it. Add 6 teaspoons of the syrup to the remaining frosting and mix until incorporated. Spoon out 1/2 of the mix into a piping bag and set aside. Tint your final portion of frosting with the remaining syrup, and beat until fully incorporated. Spoon into a final, sixth piping bag. You now have one white and 5 tinted bags of frosting. 8. Remove the cake from the fridge and set on a rotating cake stand or work surface. Using a circular pattern, pipe the white frosting on the top of the cake and about an inch down the sides of the cake. Then use the second-darkest piping bag to pipe around the cake next to the white frosting. 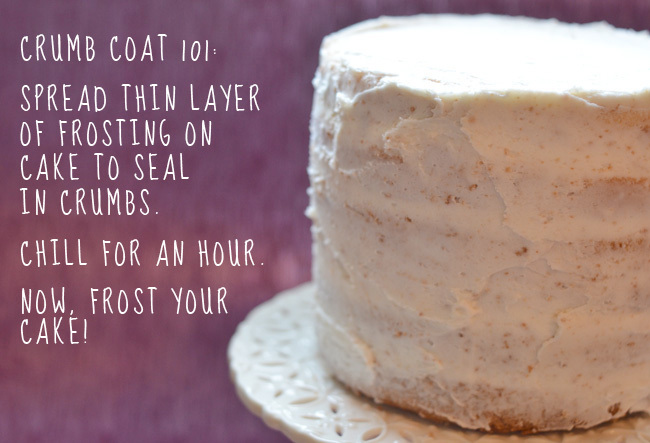 Repeat this step with all of the frosting bags until you reach the bottom of the cake with the darkest color. Use a clean offset spatula to carefully smooth out the piping lines, creating a subtle ombré gradation from light to dark. 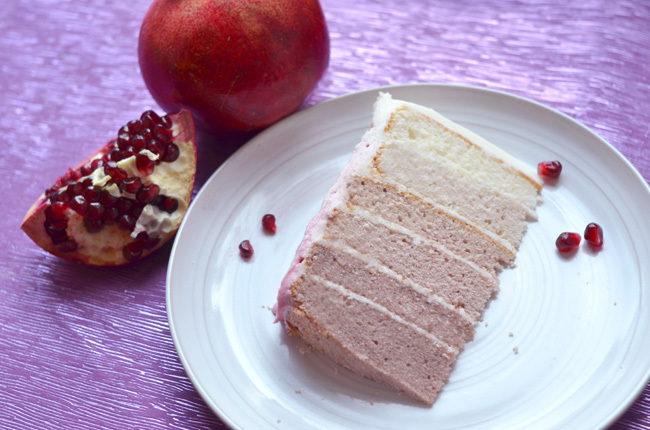 If desired, garnish the cake with pomegranate seeds. This is awesome! If I wanted different colors can you recommend any other fruit juices or dyes that could make another color combo? You can try a blueberry or blackberry reduction for a darker purple color, but if you are looking for other colors go ahead and use food coloring. Thanks! Pomegranate! Adds a definitive flavor to it too! Beautiful! Fab! 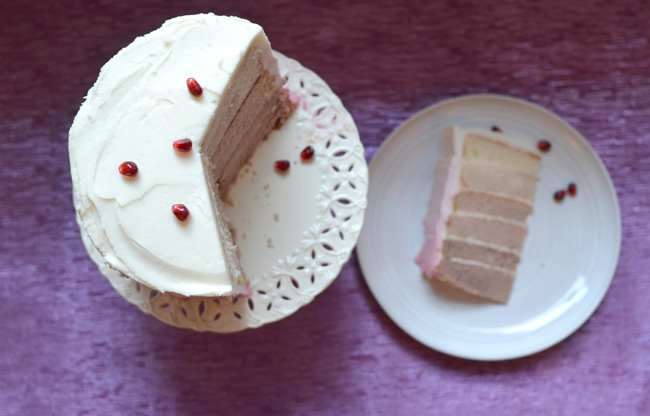 Great instructions on doing the graduated icing, and I love that gif of the cake building up! I would like to know where to purchase the adorable pouring bird with the pomegranate juice? They are measuring cups from Anthropolgie. I use them for everything! Such a creative work! I bet this cake is delicious! But I would prefer just to look at it - beautiful view and no calories :) :) :) Thank you for sharing this masterpiece!